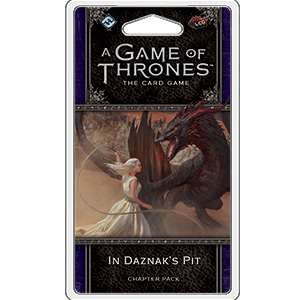 In Daznak�s Pit is the fifth Chapter Pack in the Dance of Shadows cycle for A Game of Thrones: The Card Game. Featuring three copies each of twenty new cards, this pack draws you into the world of George R. R. Martin�s A Song of Ice and Fire series where the key players in the game of thrones struggle to hold onto power as those they lead conspire against them. In the city of Meereen, Queen Daenerys Targaryen must fight for the loyalty of her people as the Brazen Beasts plot her downfall. In King�s Landing, Cersei Lannister must contend with the Faith of the Seven, battling against the power she helped them gain. And at the Wall, Jon Snow assumes the role of Lord Commander of the Night�s Watch, but as his brothers question his leadership, a sense of impending doom hangs in the frigid air.